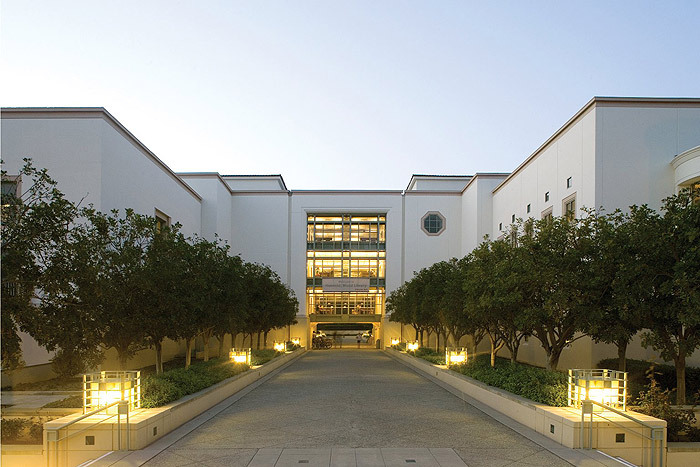 Honnold-Mudd Library is one of many shared resources among The Claremont Colleges. At Pomona, our students have the advantages of a small college, where class size averages 15 and professors teach every class, along with the opportunities offered by a larger university setting of about 8,000 students. The founding member of The Claremont Colleges, Pomona is one of five undergraduate colleges (known as the 5Cs) and two graduate institutions that make up this unique consortium. Located within one square mile, the seven adjoining campuses are only a few minutes’ walk from one another. Pomona students may supplement the College’s already comprehensive curriculum by taking classes at any of the undergraduate Claremont Colleges. The more than 2,700 courses available include intercollegiate majors and a wide range of language offerings. Although each institution is autonomous, academic calendars and registration procedures are coordinated to make cross-registration easy. An expanded catalog isn’t the only plus. A two-million volume library serves all the campuses, and the broad range of speakers’ series, guest lectures, art exhibits, plays and performances, as well as clubs and organizations at the other colleges, adds immeasurably to academic and co-curricular opportunities.